Mike Flood of Norfolk on Nebraska’s core truth: We have resources greater than anything either coast will ever have -- character, authenticity, and an unmatched work ethic. Last December, the New York Times wrote rural America’s obituary. Citing three decades of population growth in tech hubs like Boston and Silicon Valley, the message was clear: As middle America dies, the coasts’ high-skilled, high-wage workers will feed off their own success while the rest of us dwindle into nothingness. Folks living in Omaha and Lincoln are in the same boat as Norfolk, Broken Bow, and Hyannis, according to the Times. Offsetting every effort to build confidence in our state, 20- and 30 year-olds in Somerville, Massachusetts, dismiss Nebraska as “flyover country” as they create explosive value in a knowledge economy where growth depends on the quantity, quality, and accessibility of the information available, rather than the means of production. As if rural America’s death warrant from the Times wasn’t enough, pile on devastating losses from the recent flooding that destroyed hundreds of homes in small towns, crippled our transportation systems, and wiped out businesses. This hasn’t been a bright decade in northeast Nebraska when you add deadly E4 tornados in Pilger, low commodity prices, and our second 500-year flood in eight years. Despite the punishing decade, we find ourselves fortunate to live in an area where adversity is met by character, authenticity, and hard work. How many people have reflected on what we’ve been teaching our children as we pick up the pieces after horrible destruction and hard times? For close to 10 years, this May’s graduates have watched their moms and dads put aside their own problems, fight to protect the town levy, help those who have lost everything, and get up after being knocked down to try harder the next day. Nebraska’s core truth is that we have resources greater than anything either coast will ever have, but almost always take for granted. Children raised in places like Randolph, Loup City, and McCook, on farms and in small towns, excel wherever they go because they have grit, tenacity, and perseverance. These are skills the U.S. Department of Education says are critical for success in the 21st century. Think about it this way: If you have two applicants, and one was raised on a dairy farm, which one would you hire? No one else knows how to raise salt-of-the-earth kids better than rural Nebraska. The ingenuity and work ethic of those grown-up kids drives the engine of the most productive agricultural community the world has ever seen. According to a recent 4-H and Bridgespan Group study, Nebraska raises children who are in the top 10 percent of social mobility — meaning that kids who grow up without much can soar through the social strata. A life born into poverty on the coasts or the American southeast likely ends in poverty. The American dream is much more alive here thanks to parents, school systems, and community expectations. Hands down, Nebraska is the best place for someone birth to 18 to be raised. And as anyone with children will tell you, rural Nebraska is the best place to raise your children. If you’re under 18 and over 30, living in small-town Nebraska is a home run. On the other hand, for a 20-year-old to live in Alliance, Columbus, or Grand Island is as much about biology as it is opportunity. We expect young people to stay or move back to communities that revolve around 50-plus-year-olds, our preferences, and our businesses. It doesn’t work that way in larger coastal cities. When you’re in Chicago, Austin, or Denver, young people live next door, on your street, or in your building. Our regional hubs need to develop neighborhoods where being in your twenties is comfortable whether you have 50 or 500 twentysomethings around. When you’re that age, you want to be around other people that age, and often. By employing the same spatial proximity principles of agglomeration that make large cities successful — rural Nebraska, by scale, can achieve similar results. Pairing “placemaking” with economic opportunity can remedy the steady out-migration of those in their twenties. What to do with our small cities with populations under 5,000? The answer is: double down on what they do best, like raise children with imagination, grit, and integrity. Let’s walk away from handing $100,000 to a business simply for locating in a small town and provide, instead, free early childhood education for newborns to five years old. For a family with two kids, that’s a $20,000 pay raise and the peace of knowing their kids’ childhood will be remarkable. Imagine living in Des Moines and paying $22,000 in daycare, saving that money instead by moving closer to family and to the town in which you grew up? Let’s put our money on something we know is likely to be successful and increases the value of the local K-12 investment. There’s so much more to revitalizing rural Nebraska, but the best first step is taking advantage of what we already do well. Let’s actively compete for keeping our kids Nebraskans. Mike Flood of Norfolk is the former speaker of the Nebraska Legislature and served as a state senator from 2005 to 2013. 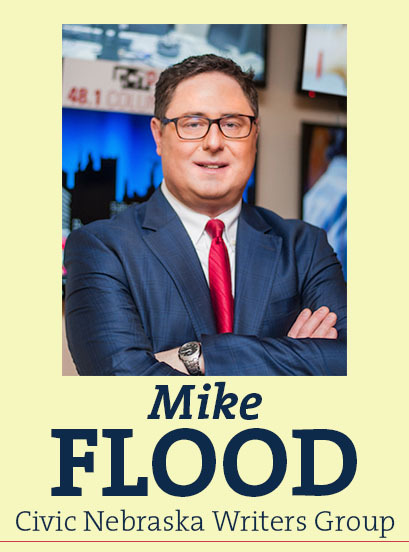 He is owner of Flood Communications, and believes it is important for Nebraskans to connect with one another around what unites our communities rather than what divides them.